Really Rocket Science » Blog Archive » Nagging in Space? Ballistic re-entry, again. Yes, that’s the story here. But there’s more: did Anatoly Perminov, head of the Russian Federal Space Agency, really say what was attributed to him? You know in Russia, there are certain bad omens about this sort of thing, but thank God that everything worked out successfully. Of course in the future, we will work somehow to ensure that the number of women will not surpass [the number of men]. This isn’t discrimination. I’m just saying that when a majority [of the crew] is female, sometimes certain kinds of unsanctioned behaviour or something else occurs, that’s what I’m talking about. Does this imply the women were ganging up on the guy to "just get us home," or something? Unsanctioned behavior — could include "nagging," but I kind of doubt that. The steeper-than-normal angle of re-entry subjects the crew to enormous gravitational force, up to 10 times that which is experienced on the ground. Nik Halik, an Australian adventurer and entrepreneur, has experienced such forces during his cosmonaut training at Star City, near Moscow. "The force in your chest, it’s incredible," he said. "It’s like a boa constrictor is just squeezing you and squeezing and you can hardly breathe. "That’s why we do training here to make sure that our bodies can cope with the actual stresses because they are very, very excessive." Mr Halik lives in a room on the floor below the quarantine area where the cosmonauts have been held since their return to Earth. He has wanted to travel in space since he was four years old and he will soon get his wish. He graduates as a cosmonaut in September after five years of study and training. Already, he’s been named as the back-up crew member for the next Soyuz mission, currently known as TMA-13. "The back-up historically has the primary spot, the following flight, which in this case will be the spring of ’09 flight," he said. "It’s incredibly exciting for an Australian civilian." 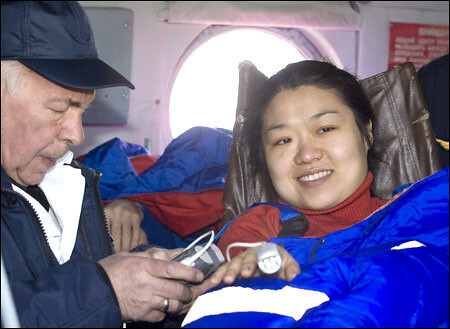 When she was salvaged from the charred Soyuz space on the Kazahkstan steppe, Yi looked so exhausted that she was not able to walk by herself. “There was a shock during landing, and I’m having trouble with my sense of direction,” she told SBS TV as she was waiting to be airlifted by a military helicopter. 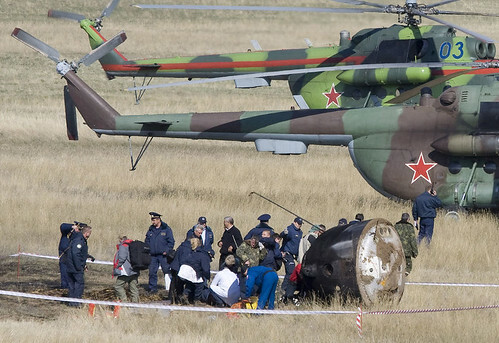 Veteran crewmates Peggy Whitson of the United States and Yuri Malenchenko of Russia also looked worn out. In a press conference held at the Kustanaj airport in Kazakhstan a few hours later, the 29-year-old Korean seemed to have regained some of her energy and cheerfulness. When asked about the most difficult part of her 12-day trip to the International Space Station, she said nothing was harder than the training she received on the ground. This entry was posted on Wednesday, April 23rd, 2008 at 7:07 am	and is filed under Around the Blogs, Navigation/GPS. You can follow any responses to this entry through the RSS 2.0 feed. You can leave a response, or trackback from your own site.